The Oklahoma Corporation Commission works closely with the Environmental Protection Agency (EPA) under the Safe Drinking Water Act to make sure disposal wells are safe, but that practice is now in serious question. … “While this technique has long been regarded as the Cadillac when it comes to protecting our fresh water, with the onset of earthquakes and the models that show the relationship between deep high water wastewater injection and earthquakes, you have to change what you mean by ‘safe,’” Skinner said. OKLAHOMA CITY – Officials with Oklahoma Natural Gas (ONG) released their preliminary results of what caused a natural gas explosion at a home on the northwest side of Oklahoma City on Jan. 2. The disaster occurred from a gas leak at a home in the 12500 block of Whispering Meadow Dr. just after 3 a.m. According to ONG investigators, the leak started from a weld seam in a section of the gas main. Investigators say that the gas escaped and migrated underground to the home where it built up and was ignited by a still unknown source inside the home. Utility crews have since removed the section of pipe where the leak occurred and will continue to examine what went wrong, while coordinating with the Oklahoma Corporation Commission. The gas main has been repaired and is safely back in service for neighboring households. OKLAHOMA CITY – Homes closest to Saturday’s explosion are mostly empty now. Many residents say they were too damaged to live in. As investigators dig for more answers, Oklahoma insurance department commissioner John Doak toured those homes Wednesday afternoon. The commissioner got a firsthand look at all the damage, while many have begun to pick up the pieces and wonder where to go next. For those that lost nearly everything in explosion on Whispering Hollow Drive. A visit from state insurance commissioner John Doak was a welcomed sight. The house erupted into flames after something sparked an explosion while Oklahoma Natural Gas workers were trying to find a leak early Saturday morning. Wednesday, the commissioner called the damage catastrophic and despite his title his focus is more about people than policies. The official word on what happened won’t be for some time. ONG said they are still working to understand what went wrong and who, if anyone, is to blame. But Doak said it’s those unknowns in life that make having insurance so important. A 3.4 magnitude earthquake was recorded near Medford late Thursday night. According to the U.S. Geological Survey, the epicenter was located nine miles southeast of Medford and 22 miles northeast of Enid. 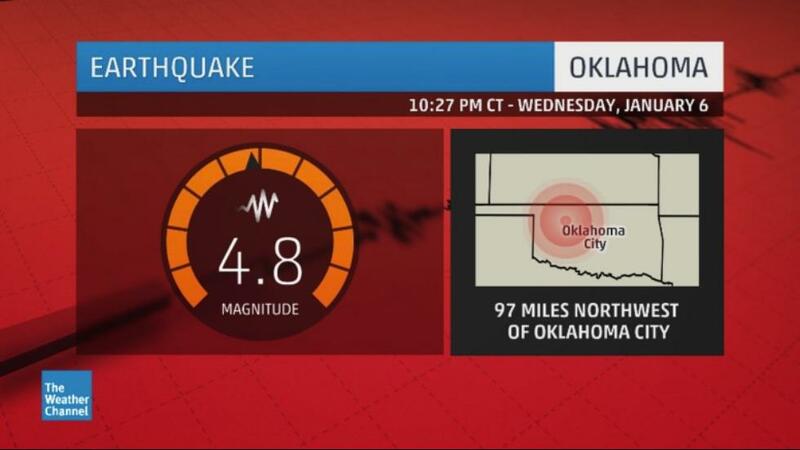 The quake struck at 11:37 p.m.
More than a dozen of earthquakes rattled Oklahoma residents overnight. While all those quakes have been a under 5.0 magnitude, experts warn we need to be ready for the big one. These 16 quakes happening now and overnight have ranged from 4.8 to 2.5 magnitude. But a geophysicist warn now is the time to prepare for the bigger ones, calling it the big warning. In the Journal Record, the USGS points to the two large Edmond earthquakes. The department said when there are two magnitude 4.0s in a single fault, it starts to look like something could rupture, And experts compared the fault to Prague, which produced a 5.6 magnitude quake in 2011. Earthquakes have shaken parts of Oklahoma at least 30 times in 19 hours. Meteorologist Ari Sarsalari has the details. A pair of moderate earthquakes shook northwest Oklahoma late Wednesday night, part of a swarm of Sooner State temblors that has produced more than two dozen quakes in less than 24 hours. A 4.7-magnitude tremor was followed 30 seconds later by another 4.8-magnitude quake centered in a sparsely populated area about 20 miles northwest of Fairview, Oklahoma, about 97 miles northwest of Oklahoma City. The quakes struck at depths of 2.1 and 3.7 miles below the surface. The twin earthquakes occurred at 10:27 p.m. CST Wednesday night and were felt from central Kansas to southern Oklahoma and the eastern Texas panhandle, including in Wichita, Kansas, and the Oklahoma City metropolitan area. KWTV said some of its viewers reported damage in their homes. There were no reported injuries in either Majors or Woods Counties, near the epicenter of the twin quakes, according to newsok.com. The 4.8-magnitude quake was the strongest in the Sooner State since the November 2011 swarm that included the state’s strongest on record, a 5.6-magnitude temblor in Prague on Nov. 6, 2011. It was the fourth strongest quake on record in Oklahoma, according to the Oklahoma Geological Survey (OGS). This was one of 30 separate earthquakes of magnitude 2.5 or greater reported in Oklahoma within a 19-hour span from Wednesday evening through early Thursday afternoon. Twenty-seven of those, including the two strongest quakes mentioned above, were clustered in southern Woods County. Two others were reported in the far northern Oklahoma City metropolitan area east-northeast of Edmond, and a third occurred around midday Thursday near Perry in north-central Oklahoma. In 2015, 907 quakes of magnitude 3.0 or greater were reported in Oklahoma, up from 584 in 2014, according to KFOR-TV. There were only 42 such earthquakes in the state in 2010 and 1 such tremor in 2005. The county’s rural water district #14, which serves an area north of McAlester recently had a water line break. Workers are still repairing those break, but district customers say the water treatment plant has been a long-time problem in itself. EDMOND, Okla. – Following a series of earthquakes that shook Edmond homes over the last several days, the Oklahoma Corporation Commission decided to take action. However, many residents are still concerned about the future of their property. The City of Edmond says it will continue to provide planning and zoning review for oil and gas wells, but their hands are tied. All cities in Oklahoma are limited by state law from “prohibiting or banning any oil and gas operations, including oil and gas exploration, drilling, fracture simulation, completion, production, maintenance, plugging and abandonment, produce water disposal, secondary recovery operations, flow and gathering lines or pipeline infrastructure,” according to State Law 809. Fallin said the Oklahoma Corporation Commission is being encouraged to adjust their policies every time something different is experienced, such as back-to-back earthquakes. Oklahomans felt a 4.7 earthquake followed by a 4.8 earthquake last night. FAIRVIEW, Okla. (AP) – Three earthquakes capable of causing moderate damage have been recorded in northwestern Oklahoma. The U.S. Geological Survey reports a magnitude 4.7 quake hit just before 10:30 p.m. Wednesday about 20 miles northwest of Fairview and a magnitude 4.8 quake struck about a half mile away less than a minute later. Two magnitude 4.0 quakes were recorded in the area just after 2:30 a.m. Thursday. Fairview police say there are no reports of damage or injuries. The quakes were felt in Kansas and the USGS says up to eight states may have been affected. Oklahoma hit with 70 quakes in a week by Trevor Hughes, January 7, 2016, USA TODAY 6:35 p.m.
A swarm of more than 70 small earthquakes has rattled Oklahoma in the past week, raising concerns that the state’s quake problem is getting worse. The largest quake measured magnitude-4.8 and struck around midnight Wednesday near the town of Fairview. No significant damage has been reported, although it shook pictures and crockery. Oklahoma in 2014 had at least 5,415 earthquakes; 585 of them were magnitude-3 or greater. In comparison, the state had just 109 magnitude-3 quakes in 2013, according to the Oklahoma Geologic Survey. Statistics for 2015 are still being compiled. A state report last year noted a connection between hydraulic fracturing and some earthquake “swarms,” and state officials say there’s a potential risk to the public due to the increase in quakes. Experts say the quakes are likely being caused by injection wells, which are particularly deep wells into which drilling byproducts and wastewater are injected, rather than wells drilled to extract oil or gas. “The OGS considers it very likely that the majority of recent earthquakes, particularly those in central and north-central Oklahoma, are triggered by the injection of produced water in disposal wells,” the agency said. Earthquakes have been linked to oil and gas activity for more than five decades, but in recent years the rate of tremors has shot up across the United States in areas where drilling and waste from the production occur, said Bill Ellsworth, a Stanford University geophysics professor and a former longtime geologist at the U.S. Geological Survey. Kansas, Oklahoma, Colorado, Texas and Arkansas all have seen steep upticks in earthquakes suspected to be linked to oil and gas activity, he said. The injected water changes the friction of naturally occurring fault lines, uncorking the quakes. “Over the past few years, there has been a growing recognition within the industry and within regulators that this is an issue that needs to be considered very carefully,” Ellsworth said. State regulators have ordered well companies operating in the area to either scale back or halt injection operations. One of the companies, Pedestal Oil Co. has been ordered to cut the amount of water it’s injecting for disposal by 50%, while Devon Energy Production, Grayhorse Operating, New Dominion and Taylor R.C. have all be ordered to reduce injection volumes by 25%. The Sierra Club is preparing to sue some of the companies that operate injection wells, among them SandRidge Exploration and Production, New Dominion, Devon Energy Production and Chesapeake Operating. SandRidge has been struggling financially as low gas and oil prices keep profits low. The company’s stock is being delisted from the New York Stock Exchange, it announced Jan. 7, and the company has said it will ignore the state’s requests that it shut down its injections wells, setting up a potential court battle. For many Oklahoma residents, the quakes have become a way of life, in much the way they have for those living in North Texas, which has seen similar quake swarms. Oklahoma’s frequent quakes prompted composer Edward Knight to create a 15-minute musical piece called Rumble, which debuts Saturday with a performance by the 2016 Central Oklahoma Directors Association All-Region High School Symphonic Honor Band. Knight said his piece features usual instruments and sounds, along with Latin chanting, to portray the Earth awakening. Members of the concert band are drawn from across the state, and the quakes are something they — and their parents and the audience — can relate to, Knight said. “It’s this ominous sort of tone that starts the piece,” he said. The earthquakes represent a challenge for Oklahoma, which depends heavily on the oil and gas industry for employment and tax revenue. Reams said many Major County residents, including himself, believe the quakes are an unfortunate but understandable byproduct of extracting the oil and gas the country needs. OKLAHOMA CITY – A state lawmaker suggested Oklahomans start pressuring their representatives to deal with earthquakes linked to disposal wells. Rep. Richard Morrissette said policymakers should do more to prevent further property damage. The scientific consensus is that disposal wells are causing Oklahoma earthquakes. “We are dumping an ocean of water, untreated back into the Earth. This is clearly manmade earthquakes,” said Morrissette (D-OKC). Morrissette said damaging earthquakes caused by injecting water into the ground are out of control. He said Oklahoma should stop any further injection wells. “What’s going to happen when dormitories in Stillwater filled full of young students fall or other catastrophes happen, everybody is going to look back and say, ‘Why didn’t we do something,’” Morrissette said. After an earthquake, the Oklahoma Corporation Commission can ask companies to reduce their water volumes of disposal wells close to epicenters. Most operators cooperate, but SandRidge Energy defied the OCC on Dec. 3 and refused. A month has now passed with no fallout. The OCC said it is doing all it can to try to change SandRidge’s permit in OCC court and could file the court request sometime next week. If a judge approves the request, compliance becomes absolutely mandatory and if a company violates its permit, it faces potential contempt action and fines. So who has the power to act immediately on disposal wells? Gov. Mary Fallin’s office said she does not have the authority under Senate Bill 809, which gave exclusive authority to the OCC. Morrissette said homeowners should call their state representative to push for a change in manmade earthquakes. “Darn it, do it, because what’s coming is going to be catastrophic,” Morrissette told News 9. The news and phone apps list the quakes as being by Alva and Fairview. In reality, they are closer to Waynoka. We live 5.5 miles SE of Waynoka. The quakes have been just SE of us. Our location is indicated by the blue dot. It is hard to believe that the first quake was only 4.3 because it hit the hardest. The house shook violently for about a minute when the second quake hit. We actually felt a rolling motion with the first quake. The third quake followed just as the second was dying down. It was very scary. At least with a tornado you can find shelter. You feel so helpless with quakes. We continued to have tremors for well over 30 minutes afterwards. Fortunately we don’t have any noticeable damage, but one has to wonder what it has done to the house structure. We did have things fall and even had a few light bulbs burn out. Interesting! The governor and AG Scott Pruitt are too busy waging their imaginary marijuana war with Colorado to worry about their state literally falling into a giant hole in the ground and Oklahoma schools closing due to budget cuts. Because its not fracing. You U must first under stand fracing before blaming it. Drinking water wells could b the cause also. Kyle Taylor I think you may want to educate yourself on fracking, before you make a comment about it. Fracking has been proven to cause earthquakes over and over again. Robert Strong, Indirectly fracking. It’s from the disposal wells. AG Pruit should be less concerned about Colorado state government AND more concerned about the constituents here, and the unseen damage to the watershed and faults caused by waste water dump, that’s inflicted on future generations that the repub base claims to be so concerned about. That “salt water” ISN’T just salt! Gas and oil companies are not required to provide a list of those chemicals. FRANK YOUR LITTLE HEARTS OUT!! I’D GLADLY TAKE A CHIMNEY LOSS AND SOME DRY WALL CRACKS SO THAT MANY OIL FIELD FAMILIES CAN SURVIVE! Many of you people out there screaming “stop the fracking” haven’t suffered any loss at all. so shut up already!! There are other ways to make money without depleting a natural resource. Money is not more important than human safety. I felt it in Yukon. Just in the last year Oklahoma has had more earthquakes than all of the other 50 states combined. What is everyone waiting on before they finally stop the fracking? A disaster? It’s completely irresponsible to ignore these warning signs. Do our Schools have Earthquake drills? I know my childs school doesn’t have them. So what are they going to do if a large Earthquake hits? I am disgusted that our Governor is not doing more to protect her great state. Money is not more important than the safety of our children. All of our schools are built with steal rebar reinforced concrete. These are minor earthquakes that in no way are a looming indication of… “the big one”. Get a grip. Fracking has NOTHING to do with earth quakes contrary to the tree huggers moaning. Earth quakes are the result of a tectonic plates shifting. Drilling a hole in the ground has absolutly no effect on a plate shifting. Man the amount of people defending oil companies is staggering. They’re helping the media help the oil companies cover up the excuses, which the oil companies surely thank. I can’t wait until they blame the next lake, seeing as Arcadia is the reason why we had the last quakes *rolls eyes*. Garry Steve, you’re right, it’s not fracking, but they are caused by injection wells. You can’t inject millions and millions of gallons of water into the earth, and not expect some kind of reaction. In the 1960s Colorado had a bunch of earthquakes triggered from injecting waste water into a well. One was a 5.3 and caused millions of dollars in damages. A disposal well in Nebraska got approval in April, and guess what? They are having earthquakes now. Many, many geologists agree that injection wells are the cause of these earthquakes. David Kirkham the ignorance is overwhelming. The blind follow the blind. Greed is a terrible thing, and oil tycoons have their hands in too many politician’s pockets. I am just glad I have a mind of my own. Grateful I have a voice to speak, and the freedom to do so. Felt the first one in Stillwater. I would have felt the one around 10:37 because I was watching movie and heard and saw things shaking, so I paused the movie and listened. I also heard the thunder rumbling during the earthquake as well as some other residents here in Woodward in Northwest Oklahoma. I cant believe the activity out there in the past couple years , its got to be un-nerving to say the least .. It’d certainly keep me up wondering WTF is going on !! Is that connected to the New Madrid fault ? I knew I wasn’t crazy. I felt one at Ft Sill and they looked at me like I was nuts. But that had to be it. Remember the good old days when a few 2.5 quakes around Jones were a big deal. That was only six years ago. How things have changed. Ok folks. start at thre top. Vote em out.Enuf!!!! Watonga. Even shook daughters hospital bed. Whoa I’m in Lawton and I thought that’s what it was, then I thought no…. That’s Crazy! Josh Rose · Driver at J.B. Hunt Transport Services, Inc. Felt in Newalla, OK. Tired of the politicians siding with big business at the public’s expense. Vote the idiots out. And stop fracking. They were felt in Wichita and Hutchison Ks also!! Felt it in Sayre, Beckham County. Ok sandridge oil company I think it is time for you to obey occ’s orders and shut down your waste water wells before you have an angry mob comes knocking on your door!! And yet we still have self-described “experts” telling us that it’s due to rising lake levels or other natural causes, not waste water injection. How much you want to bet they work for an oil company? I thought those were closer than that. Definitely felt them here in south OKC!! Flickered my lights and had my lamp pull chains swaying!!! Felt it in Moore Ok. Felt it in EL Reno and lasted a long time, was really strong as well. Felt in Guthrie.. I thought it was one really long quake because the stuff didn’t have time to stop rattling between the first and second quakes. The 4.3 and 4.8. I feel so many where I am located that I figured these were a lot closer than they actually were. Felt it 9 miles west of Watonga! We felt them in Woodward. Felt in in Carnegie, Oklahoma. Seems to have lasted longer than the other ones i’ve been through. My Husband and I felt these in Morrison! A friend also felt them in Perkins. MAJOR COUNTY, Oklahoma – Many 3.0-or-larger earthquakes rocked northern Oklahoma Wednesday night into Thursday. And dozens of residents called into News 9 after feeling the long lasting quakes. The first, a 4.3 magnitude earthquake struck at approximately 10:27 p.m. Its epicenter was located 19 miles northwest of Fairview, 36 miles east of Woodward, 47 miles west of Enid, and 64 miles north of Weatherford. It was about two and a half miles deep. The second, a 4.8 magnitude earthquake, struck at 10:28 p.m. Its epicenter was located 14 miles south, southeast of Alva, 40 miles west, northwest of Enid, and 45 miles east, northeast of Woodward. It was over four miles deep. The third, a 3.4 magnitude earthquake, struck at approximately 10:37 p.m. Its epicenter was located 20 miles south of Alva, 37 miles east Woodward, and 46 miles west of Enid. It was about two and a half miles deep. The fourth, another 3.4 magnitude earthquake, struck at approximately 10:49 p.m. Its epicenter was located 18 miles northwest of Fairview, 37 miles east of Woodward, and 46 miles west of Enid. It was about two and a half miles deep. 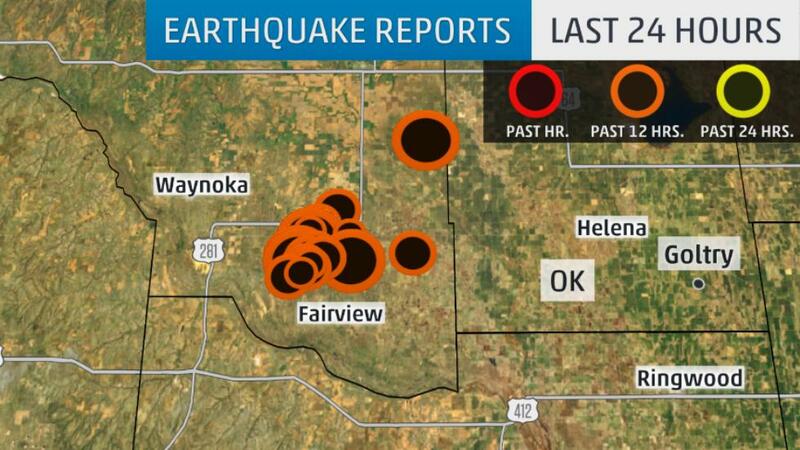 The fifth was a 3.3 that struck at 11:19 p.m. 15 miles northwest of Fairview and 39 miles west of Enid. The sixth was a 3.0 that hit at 11:37 p.m. 19 miles northwest of Fairview, very close to the fifth earthquake. The quake was 37 miles east of Woodward. The seventh was a 3.2 that occurred at 12:03 a.m. 19 miles south of Alva and 39 miles east of Woodward. The eighth, a 3.5, struck at 12:38 a.m. 19 miles northwest of Fairview, very close to the location of quake No. 6. The ninth, 10th and 11th quakes were in almost the exact same spot. A 3.3 struck at 2:02 a.m. 19 miles northwest of Fairview and 37 miles east of Woodward. The tenth was a 3.7 just one mile from quake No. 9. The 11th quake, a 4.0. struck at 2:37 a.m. 16 miles northwest of Fairview. Another 3.0 quake rattled at 4:48 a.m. in the same area about 18 miles northwest of Fairview. Yet another quake, a 3.5, shook at 4:48 a.m. 19 miles northwest of Fairview. At 7:41 a.m., a 3.6 magnitude quake was recorded 16 miles northwest of Fairview. At noon, a 3.1 magnitude quake was recorded 17 miles northwest of Fairview. At 12:34 p.m., a 3.3. magnitude quake was recorded 17 miles northwest of Fariview. Just before 2:00 p.m., a 4.0 magnitude quake was recorded 18 miles northwest of Fairview. EDMOND, Okla. – As many Edmond residents are still a bit shaken after a large earthquake rattled the area in the new year, one Oklahoma lawmaker says he has had enough. On New Year’s Day, many residents reported feeling a 4.2 magnitude earthquake that hit the area. Some say the quakes are becoming a common theme in certain parts of town, but one lawmaker is tired of it. Oklahoma Rep. Richard Morrissette decided to write an open letter to Chad Warmington, the president of the Oklahoma Oil and Gas Association. “In response to your remarks that appear in the Oklahoman article of January 5, 2016, regarding seismic activity and what you describe as my “politicizing” this issue and showing disrespect and a lack of understanding of the hard work of the Oklahoma Corporation Commission and other researchers, let me share the following and say that you insult my intelligence and that of my fellow Oklahomans with your characterization. After the significant earthquakes in Edmond, OK, last week, the Oklahoma Corporation Commission responded by saying that they were puzzled because there were “no known operational wells near ground zero” and they had no knowledge of any faults in the area. Now, they are saying there are 5 operating wells within 10 miles or so of ground zero and disposal wells within 3.5 miles and we have independent confirmation of a nightmare scenario in the comments of USGS seismologist Daniel McNamara that the basement rock in the Arbuckle formation is saturated from years of wastewater disposal and any stress could trigger a fault to fail. Devon Energy Corp’s Harvey 1-11 and Pedestal Oil Co. are now willing to shutter 5 wells and reduce by 20% injection activity on others. It just isn’t that difficult to understand, Mr. Warmington. Industry giants like Devon do not cease production unless there’s a real problem. The statutes give the Oklahoma Corporation Commission the authority to shut down these wells yet they have waited for such quakes as those in Edmond to occur, acting with weakness and fear, while approaching one of the biggest offenders, SandRidge Energy, with notes of polite requests that have produced no results for our citizens. … Now, the fossil fuel industry sees the ‘writing on the environmental wall’ and decides to expedite production, before this form of energy goes the way of coal. Following the earthquakes, the Oklahoma Corporation Commission ordered five wells within 10 miles of the recent Edmond earthquakes epicenters to operate at reduced volumes. Only one well by Pedestal Oil Company will be reduced by 50 percent. Four others by Devon Energy, Grayhorse operating, New Dominion and Taylor R C operating will be reduced by 25 percent. While many of the oil companies that operate in the state have followed the commission’s requests to reduce disposal well injections, one company is not complying. OKLAHOMA – A political showdown, or a genuine cry for help? They’re usually tight-lipped about the earthquakes in Oklahoma. But, the president of the association assures they’re doing all they can to help the Oklahoma shake-down. “The notion that the governor and commission aren’t doing anything isn’t accurate. It’s not fair,” [For the owners of the many homes destroyed in the natural gas explosion in Oklahoma City, and the endless more with damages across the state?] said Chad Warmington, president of the Oklahoma Oil and Gas Association. We spoke with Jeremy Boak, the director of the Oklahoma Geological Survey, who said it’s partially true. In the first half of 2015, Oklahoma experienced 53 more earthquakes of 3.0 magnitude or greater. In the second half, it went down by 10 percent. “In the first half of 2015 (January through June), there were 480 M3.0+ and 14 M4.0+ earthquakes. In the second half (July through December), there were 427 M3.0+ and 15 M4.0+ earthquakes. There were about 10 percent fewer of the M3.0+ earthquakes, but more of the earthquakes were of the larger magnitude, so it is unclear if there was a truly significant change in seismic energy release. However, it does at least suggest a flattening for the first time since 2012. NORMAN — Snippets of the melody have drifted across Oklahoma for weeks. It has wafted from the trumpet of Sarah Stevens in Noble, the trombone of Trey Cole from Edmond Santa Fe and the clarinet of Molly Spencer in Yukon. They are among the 101 musicians from 24 high schools selected for the 2016 Central Oklahoma Directors Association All-Region High School Symphonic Honor Band. After weeks of practicing individually, the students will join forces Saturday to present the world premiere of “Rumble,” a 15-minute piece for concert band by award-winning Oklahoma composer Edward Knight, according to a news release. The Honor Band will perform the piece in a free concert at 2 p.m. at Sharp Recital Hall at the University of Oklahoma. Knight said the inspiration for “Rumble” came from the increasingly frequent earthquakes that have rocked the state. “This music is as dramatic as the earthquakes themselves — everything from haunting, ancient, creaking sounds to pulsating, shattering stuff,” Knight said. “Rumble” is the ninth American work to be commissioned and premiered by the Central Oklahoma Directors Association over the past 22 years. The project brings in guest composers and conductors to work with students from the association’s wind ensemble, symphonic band and middle school ensemble on contemporary music. Knight will be on hand for the band’s nine hours of rehearsals, working with the musicians on bringing the piece to life under the baton of Colorado conductor Alan W. Mills. After talking to the Corporation Commission I’m at least convinced that they have this earthquake problem at their top of their list of concerns. I asked how concerned you are about the quakes and injection wells. I did Rob, and the experts at USC told me they’re absolutely being triggered by injection wells. OKLAHOMA CITY – There’s been a series of 2.9 or greater earthquakes in the Edmond area. It’s not the first time earthquakes have hit but, as they get closer to the metro, some sate legislators said they’ve kept silent long enough. Many Edmond residents experienced the earthquakes and had damage. Morissette said the state needs to shut down the wells not just bring temporary solutions. His reaction comes after three major earthquakes originated in Edmond early Tuesday morning near I-35 and Covell. The Oklahoma Corporation Commission said they’re doing everything they can to help reduce the number of earthquakes. “We need to shut these wells down,” Morrissette said. He said the state needs to stop dancing around the issue. The law basically says the corporation commission has the power and authority to rule over the oil and gas industry. It’s something they said they are doing, based on new data that becomes available from oil companies. According to the Corporation Commission, to date, the July and March directives have resulted in 224 wells plugging back.